Amazon.com description: Product Description: From the National Book Award finalist Lauren Redniss, author of Radioactive, comes a dazzling fusion of storytelling, visual art, and reportage that grapples with weather in all its dimensions: its danger and its beauty, why it happens and what it means. Weather is the very air we breatheâit shapes our daily lives and alters the course of history. 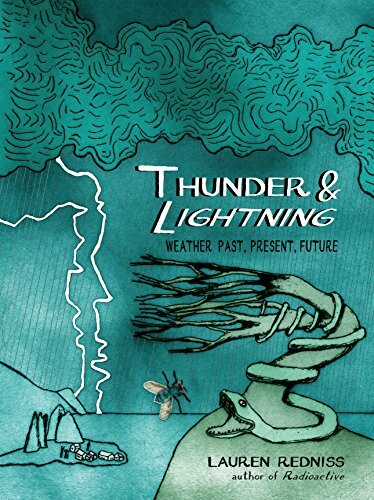 In Thunder & Lightning, Lauren Redniss tells the story of weather and humankind through the ages. This wide-ranging work roams from the driest desert on earth to a frigid island in the Arctic, from the Biblical flood to the defeat of the Spanish Armada. Redniss visits the headquarters of the National Weather Service, recounts top-secret rainmaking operations during the Vietnam War, and examines the economic impact of disasters like Hurricane Katrina. Drawing on extensive research and countless interviews, she examines our own day and age, from our most personal decisionsâDo I need an umbrella today?âto the awesome challenges we face with global climate change. Redniss produced each element of Thunder & Lightning: the text, the artwork, the covers, and every page in between. She created many of the images using the antiquated printmaking technique copper plate photogravure etching. She even designed the bookâs typeface. About: From the National Book Award finalist Lauren Redniss, author of Radioactive, comes a dazzling fusion of storytelling, visual art, and reportage that grapples with weather in all its dimensions: its danger and its beauty, why it happens and what it means.